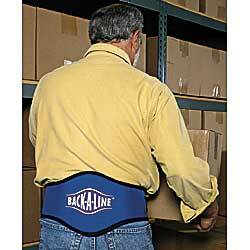 BACK-A-LINE® firm support pad fits into the natural curve of the spine and supports its proper posture. Orthopedically correct belt has a built-in lumbar pad that fits into the natural position of the spine, alleviating pain and fatigue associated with improper posture. Grooved 8" tall lumbar pad covers the full range of the spine. Washable, breathable fabric will not stretch, holding the lumbar pad firmly in place. OrthoWick®lining stays dry. SPECIFY WAIST SIZE: B - Medium (31"36"), C - Large (35"40"). IN STOCK.